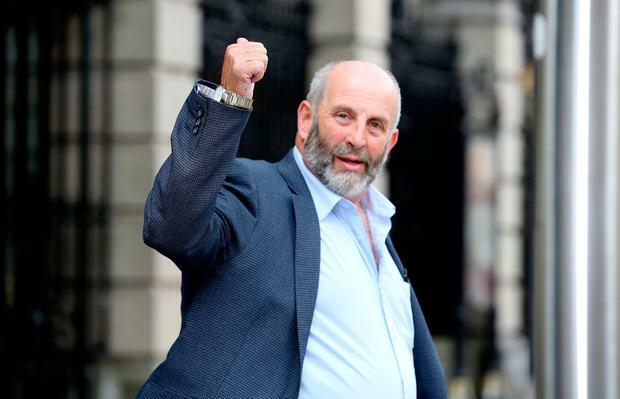 Kerry TD Danny Healy-Rae said he has sought legal advice after being branded a "road traffic terrorist" by Transport Minister Shane Ross. Mr Healy-Rae took issue with the minister in the Dáil last night after Mr Ross criticised him for opposing the introduction of new drink-driving laws. The Kerry TD has been outspoken in his opposition to the minister's proposals to introduce automatic bans for people caught driving under the influence. Mr Ross said opposing the measures is costing lives. He wants motorists banned if they are detected with 50 to 80 milligrams of alcohol per 100ml of blood. He appealed for Mr Healy-Rae and other TDs speaking out against the measures to allow the Road Traffic Bill to pass through the Dáil without opposition. "I'll take this opportunity to appeal to Danny Healy-Rae and his gang to stop the filibuster," said Mr Ross. "They are behaving like road traffic terrorists. "There is a kind of guerilla warfare going on that is costing lives. "I appeal to those very few people left opposing this in the Dáil to stop the filibuster, stop the guerilla warfare and to allow this legislation through, which is the will of the Dáil." The minister was speaking at a road safety awareness drive urging people to express caution over the upcoming bank holiday weekend. Last night, Mr Healy-Rae told the Dáil he has taken legal advice because he was "hurt" by the minister's comments. "I don't understand why I am being called a terrorist," said Mr Healy-Rae. "I have to say to you minister that I have a family at home as well and I don't think you or anyone in here or outside or anywhere would like to be called a terrorist. I will be dealing with that in another fashion and I have sought legal advice." Mr Healy-Rae, who does not drink, has repeatedly said small volumes of alcohol do not impair a person's ability to drive. He accused the minister of discriminating against people living in rural areas because automatic bans would have a greater social impact there than in urban areas.